For disposal of household hazardous waste, please use the Moderate Risk Waste Facility (MRWF) at the Regional Transfer Station located at 3501 West 18th Street, Port Angeles. The MRWF is open Wednesdays and Saturdays from 11 am – 4 pm. The facility accepts hazardous household items like oil-based paints, aerosols, automotive products, household cleaners, fertilizers, garden products, pesticides/herbicides, equipment containing mercury, hobby chemicals, flammable liquids, corrosives, oxidizers, solvents, and other hazardous materials. For more information call the Transfer Station Scalehouse at 360-417-4875 or Clallam County Environmental Health at 360-417-2258. For more information see our brochure. At this time, the MRWF does not accept business waste, latex paint, or fluorescent tubes or compact bulbs. Please bring waste in original containers if possible. The facility is not equipped to handle 55 gallon drums; put the waste in smaller containers to take to the facility. You will need to leave the container at the facility. If you have additional questions about household hazardous waste disposal, please contact Environmental Health using our email form or call us at 360-417-2258. The annual Household Hazardous Waste Collection Event has been discontinued. For information about hazardous waste disposal, contact the City of Port Angeles at 360-417-4875 or Clallam County Environmental Health at 360-417-2258. An important phone number to have posted next to your phone or stored in your phone is the Washington Poison Center at 1-800-222-1222. The Washington Poison Center (WAPC) is a statewide provider of immediate, free, and expert treatment advice and assistance on the telephone in case of exposure to poisonous, hazardous, or toxic substances. For more information on the services offered at WAPC, go to their website at Washington Poison Center. Inside your house, there are many alternatives to cleaners with hazardous chemicals. With baking soda, vinegar, oil soap (like Murphy’s Oil Soap), reusable dust cloth, and water, you can keep your home clean using safe alternatives. All-Purpose Cleaner for spots on linoleum, tile and woodwork: Use Murphy’s Oil Soap; mix a drop of soap on a wet washcloth and rub briskly. Window and Mirror Cleaner: Use ¼ cup vinegar in a spray bottle and fill to the top with water. Spray onto surface and rub with cloth. For outdoor windows, use a sponge and wash with warm water with a few drops of liquid soap. Rinse well and squeegee dry. Tub and Sink Cleaner: Use baking soda as a scouring powder. Add water to make a paste and scrub with a sponge or wet rag. Add a little soap for additional cleaning. Rinse well with water to avoid a hazy film on the surfaces. 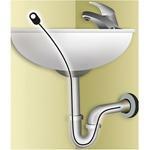 Drain Cleaner: Pour ½ cup of baking soda down the drain first, then add ½ cup of vinegar. Let the mixture fizz for ten minutes. Then pour a teakettle full of boiling water. Repeat if needed. If the clog is stubborn, use a plunger or mechanical snake. Toilet Bowl Cleaner: Sprinkle baking soda inside the bowl like a scouring powder. Add a few drops of oil soap into the bowl. Scrub with a toilet bowl brush and finish outside surfaces with a rag sprinkled with baking soda. Oven Cleaner: Mix 1 cup of baking soda with enough water to make a paste. Apply to oven surfaces and let stand for 10-15 minutes. Use a scouring pad for scrubbing. Use a spatula to get under large food deposits. You may need to rub hard, but it is not toxic to you, your family, or your pets. Do not use this on self cleaning ovens. Linoleum Floor Cleaner: Mop with a mixture of ½ cup of vinegar in a bucket of warm water. The vinegar odor quickly goes away after the floor dries. Copper Cleaner: Mix equal parts of vinegar and salt (approximately 1 T. each) and apply to the copper surface with a rag. Rinse thoroughly with water afterwards, otherwise it will corrode. Apply a little vegetable oil with a cloth and rub to get a shine. Do not use on this on lacquered finishes. The Local Hazardous Waste Management Program in King County wrote an excellent guide called Grow Smart, Grow Safe a Consumer Guide to Lawn and Garden Products. It provides information about how to garden using natural yard care techniques rather than toxic pesticides. The National Institutes of Health Household Products Database provides information on potential health risks of particular products, by name of product. The Environmental Protection Agency provides information about products that contribute to indoor air pollution. The Washington Poison Center provides Mr. Yuk stickers and more. The toll-free number is 1-800-222-1222. Healthy Homes and Gardens — Washington Toxics Coalition – Washington Toxics Coalition’s website with information about Healthy Homes and Gardens. Antifreeze: Antifreeze can be safely disposed for free at the Blue Mountain Transfer Station and the Port Angeles Regional Transfer Station during regular operating hours. Asbestos: See the Air Quality Section and ORCAA for details on Asbestos disposal. Auto Batteries: Auto batteries can be safely disposed for free at the Port Angeles Regional Transfer Station during regular operating hours. They can also be taken to the City of Sequim Yard at 169 W. Hemlock Street, Monday-Friday, 7:30am-4:30pm. Many auto battery retailers will accept auto batteries for free. Button batteries: These batteries are named for being small round and silver-colored. They are most commonly found in watches, hearing aids, cameras, calculators, and other small electronic devices. The MRWF will accept button size batteries. Alkaline Batteries: Residents can take alkaline batteries to the MRWF and Around Again, or throw them away in the residential garbage. Rechargeable Batteries: Rechargeable batteries such as Nickel Cadmium (Ni-Cad), Nickel Metal Hydride (NiMH), Lithium Ion (LiIon) and small rechargeable lead batteries under two pounds can be recycled free of charge. Visit the Rechargeable Battery Recycling Corporation site (Call2Recycle) for the store nearest you. Also, if you are visiting the MRWF to dispose of other hazardous waste, you can bring rechargeable batteries so as not tomake two trips. Computers: Computers, including the CPU and monitor, and televisions can be recycled for free through the EcycleWashington.org program. Computers, monitors, and televisions can be recycled at various locations, including Goodwill in Port Angeles and Sequim. Please check the website for current collection site information. Latex Paint: Latex paint is not accepted at the MRWF. For disposal, check if someone you know can use it, or put it on www.2good2toss.com . If it must be disposed, it can be solidified by putting cat litter or sawdust in the can and allowing the paint to solidify. Once the paint has hardened, it can be placed in the garbage can with regular pick up. Light Bulbs: Compact Fluorescent Tubes (CFLs), High Intensity Discharge (HID), and Fluorescent Tubes: Residents can take CFLs, HID, and fluorescent tubes to participating local retailers for free recycling. In Port Angeles, bulbs can be taken to Swain's, and Thurman's Supply; in Sequim, bulbs can be taken to Around Again. For information on current collection site information and the statewide collection program plan, go to www.lightrecycle.org. Commercial customers can purchase a recycling shipping box at the local Consolidated Electrical Distributors, 360-452-9705. There are other recycling options, including businesses who sell boxes to mail back to their facility. Pharmaceuticals: Currently, pharmaceuticals or unwanted medicines temporarily can be disposed at the Clallam County Sheriff’s Office and Jim’s Pharmacy in Port Angeles and the Sequim Police Department during normal business hours. Only law enforcement can accept controlled substances such as narcotics and stimulants. For information on permanent disposal information and laws, go to Take Back Your Meds. In 2018, Clallam County will be working on a new secure pharmaceutical take-back program. Stay tuned for updates. Motor Oil: Motor oil can be taken to many sites in Clallam County for free. During normal operating hours, it can be taken to Blue Mountain Transfer Station in Port Angeles, the Port Angeles Regional Transfer Station in Port Angeles, City of Sequim Maintenance Yard in Sequim, West Waste Transfer Station in Forks, and at Port of Port Angeles John Wayne Marina in Sequim and Boat Haven East and West in Port Angeles. Many automotive retailers also accept used motor oil at no cost. Syringe Disposal: Syringes and sharps from household or pet use can be put in a hard sided plastic container, like a 2-liter bottle, labeled in large, preferably red print “Danger-Contains Sharps”, and thrown in the garbage. For more information, go to Clallam County Syringe Disposal. If you have additional questions about household hazardous waste disposal options, please contact Environmental Health using our email form or call us at 360-417-2258. Environmental Health Services has published an entertaining and educational handout about household hazardous waste. This handout is full of information about the effects of household chemicals, and offers less toxic options for cleaning and yard care. It also has tips on how to dispose of things like engine oil, antifreeze and paint. This publication will be online soon. In the meantime, it is available from the Environmental Health office, please contact us to request a copy. The Household Hazardous Products List - Local Hazardous Waste Management Program in King County has a detailed website about household hazardous waste management. They offer tips about safer alternatives for cleaning your home and caring for your garden. There is also information about disposal of materials such as paint and car products. Remember, their site is designed for residents of King County, so the information about disposal events and other services is for the Seattle area. 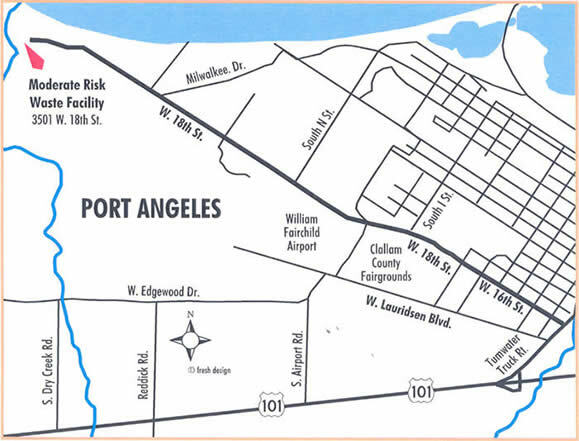 The City of Port Angeles has additional information at City of Port Angeles HHW.